A unique high performance marker that produces crisp sharp lines for freehand drawing or for use with a straightedge. 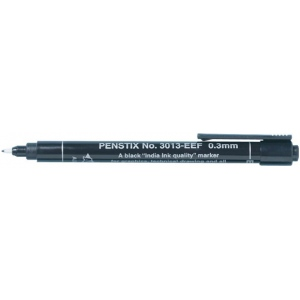 * The dense India ink-quality black ink will not bleed through most papers and is perfect for technical drawing sketching fine art lettering and illustration. * Favored by cartoonists worldwide. * The durable plastic fiber nib will not clog. * Features convenient pocket clip and ribbed cap that fits snugly on the barrel.